Relatives of four men killed by Afghan and US-led troops in east Afghanistan say they were all innocent men. A 13-year-old girl was also killed in the raid in Khost province, which a US-led coalition statement said was aimed at "suspected terrorists". Meanwhile President Hamid Karzai has met the head of Nato troops in the country to discuss how to prevent civilian casualties. He said he was worried by incidents of Nato soldiers "shooting around". News of Tuesday's shooting in Khost first came from the US-led coalition. A statement described the four dead men as "suspected terrorists" who refused to comply with "verbal warnings" to surrender and fired upon the troops. The incident happened when the security forces raided a house at Darnami village and requested the people to surrender peacefully, the statement said. Local people contacted by the BBC said the dead men and dead girl were all members of the same extended family. They said one of them was a policemen and that none of them had links with the Taleban or Al Qaeda. Surviving family members said they had been attacked by the Taleban before. They said that when they realised their house was surrounded, some of them went outside with their rifles and came under fire from the coalition troops. 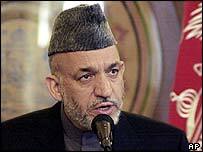 In the south of the country, President Karzai has made an impassioned plea to Nato troops to avoid civilian casualties. "We've had incidents involving Nato convoys shooting around, in Kabul and Kandahar, especially," he told a news conference after talks with Nato commanders. "We are rightly angered by it and worried by it. Nato is also worried by it, and is working with us to reduce such casualties." On Saturday it was revealed that an investigation had been held into allegations that British troops had opened fire indiscriminately in Kandahar city after a suicide car bomb attack on a Nato-led convoy. The head of Nato troops in Afghanistan, Lt Gen David Richards acknowledged Mr Karzai's concerns. "There's been too much of this sort of thing going on across the force," he told the BBC. "I have made it very clear it's got to be reviewed, the procedures, the training. The psychological damage on the population for getting it wrong is immense." Violence in Afghanistan is at its worst since the fall of the Taleban in 2001. Some 4,000 people are believed to have died this year alone in the Taleban-led insurgency - about a quarter of them civilians. Suicide attacks and roadside bombings, particularly in the south and east, are an almost daily occurrence.